By Jesse Schedeen The popular card game Magic: The Gathering is expanding to comics once again. We can exclusively reveal that Wizards of the Coast and IDW Publishing are collaborating on a new series called Magic: The Gathering - Chandra, one timed to coincide with the 25th anniversary of the franchise. The new series will focus on Chandra Nalaar, a Planeswalker who plays a key role in Magic: The Gathering lore. The series will be written by Vita Ayala (Supergirl) and drawn by Harvey Tolibao (X-Men). One of IDW's goals with the new series is to offer a clean gateway into the Magic universe for readers who aren't necessarily familiar with the 25 years of existing lore. This series is billed as a "fresh start" for the franchise with "an all-new approach to storytelling," according to IDW's press release. The new series isn't connected to IDW's previous Magic comic from 2014. Ayala explained that new reader-friendly approach in an email interview. "With this story, the team and I wanted very much to introduce people who may not be familiar with the game to the rich characters, worlds, and lore that have come from it, in an accessible way! There have been comics before, of course, but as many have said, every comic is someone’s first comic, and to be able to entice people to check out something as amazing as the Magic: The Gathering universe while getting to tell a compelling story about a character as complex and interesting as Chandra is such a thrill!" Ayala also revealed that the series will focus a great deal on the fundamental link between Planeswalkers and the magic they wield. "One of the aspects that I wanted to highlight in the story is the connection between the characters and their magic – how their mental, emotional, and physical states can effect how they manifest their magic. Literally WHO someone IS affects what they can do, magic-wise, in this universe." Ayala continued, "The challenge is to do this in a way that doesn’t get too into the minutia of mana and the mechanics of that stuff more closely linked to the card game. I think the team and I have managed to do it, in a subtle, organic way that enhances all the cool stuff that Chandra (and other characters) can do! The antagonist of the series is as good an example of this as Chandra is, and I am excited to see how people react to the push and pull of their dynamic!" Finally, Ayala made it clear that her love for the card game is fueling her excitement for this project. "I have been playing the game on and off for probably about sixteen years now. There were cycles in my life where I didn’t collect as much (college was a lean time, wallet-wise), but Magic has been a constant in my life in terms of the mythos and community building since I was a teenager. I ride or die for a couple of the characters – Garruk, Chandra, Kiora, Xenagos, and Samut especially. Like, I used to carry a Garruk, Primal Hunter in my wallet. He is in a deck right now, though, so I have a Solitary Hunter, Hallar the Fire Fletcher, and Frazzled Editor in there instead!" Look for Magic: The Gathering - Chandra #1 to hit stores in November 2018. Based only on that interview, and not knowing any of Ayala's earlier work, I'm allowing myself some cautious optimism about this. Having a writer who loves the franchise is usually a good thing, and separating the comic from the heavier established lore is probably a good call. 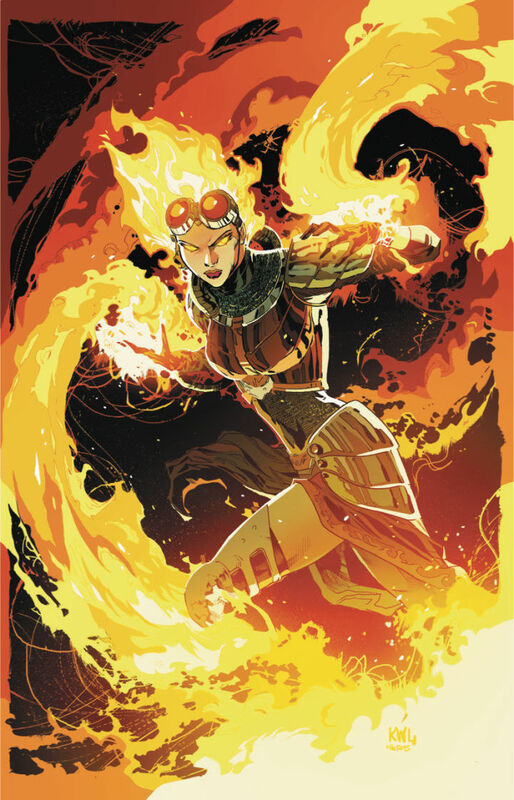 An adventurous Planeswalker and powerful pyromancer, Chandra Nalaar has seen much in her time — but she had never experienced such tragedy before. In the wake of a devastating loss, Chandra is striking out on her own, determined to prove—to her family and to herself—that next time she’ll be prepared. But when faced with threats both old and new, will she be able to overcome her grief in time to survive? And who is that familiar face lurking in the shadows? Based on the interview, this comic will take place after the new Ravnica set. So, on the one hand, Chandra makes it out of the Bolas invasion of Ravnica alive. On the other hand.....**** goes down and someone or someones don't. Right now Chandra really only cares about two other 'Walkers, Gideon and Nissa. Place your bets! Well it won't be Nissa, I'll tell you that. There's a non 0% chance it could be Nissa. with the arrival of Vivian and MaRo assuring everyone that they plan on using Garruk more, we now have three mono-green 'Walkers (once we get Garruk cured). It would not be unexpected after Nissa's exit from the Gatewatch that she has a soul-searching moment back on Zendikar, decides to go help her friends, and shows up late to the party during the main fight with Bolas, does a thing, and ends up dying because of it, which would probably make Chandra really sad. Is it a high chance any of that will happen? Not really. But they don't have a good stand-in for Gideon right now since we lost Elspeth. Ajani is currently sitting in the watch. They're clearly willing to print him as mono white as well. That said, I doubt it will be Nissa. She left, not really as a narrative device, but because she was so unpopular. Beyond that, there's a lot of text in between the lines that Gideon is heading for a nasty end. But wouldn't Nissa being unpopular make them more willing to kill her off? If people want more Gideon and less Nissa, why not give her a satisfying end with an ultimately futile heroic sacrifice? Like, don't even give her any focus until it happens. Have Bolas corner the heroes, and just as he's about to strike them down, Nissa shows up out of nowhere, yells at them to run, and gets herself killed. Leave it to the likable characters to figure out why she did it. She left, not really as a narrative device, but because she was so unpopular. The information put out at the time indicated that had been planned for a while and there's foreshadowing setting up her growing discomfort with the Gatewatch as far back as Amonkhet, an entire year before. Amonkhet was also the first set they could apply any feedback from consumers gathered in the period during Battle for Zendikar. You might not mind Nissa, and I know she has a dedicated fanbase out there, but statements made during her departure and a LOT of fan criticism point to the fact she was bumped out of the limelight for that reason. feel like some of those quotes have internet losers real angry about "THE SJW AGENDA"
idk, seems pretty clear cut to me. Female black comic author that has worked at DC, a company that has become pretty infamous at this point, is going to write a comic for WotC, another heavily left-leaning company. I don't know what comments are being talked about, but I would be surprised if anything in the actual article actually matters for the discourse. I also don't know if she actually has any qualities as an author, since I don't consume American media. I'd be surprised if the majority of people arguing about this has any idea either though. Thought I appreciate the guy whining about wotc recruiting people that he doesn't agree with politically, also whining about people online that are whining about wotc recruiting people they don't agree with politically. "One of the aspects that I wanted to highlight in the story is the connection between the characters and their magic – how their mental, emotional, and physical states can effect how they manifest their magic. Literally WHO someone IS affects what they can do, magic-wise, in this universe." "OBVIOUSLY THE WIZARDS OF THE COAST ARE PUSHING THEIR SJW AGENDA OF SLEF IDENTIFICATION OF THE SIXTY SEVEN GENDERS AND PIZZAGATE AND HILLARY AND EMAILS" - my facebook feed, eventually. Not to mention all the other stuff Mown mentioned, except the random ad hominem that makes no sense. The hilarious part, at least to me, is the opposite side that will genuinely start defending all that preposterous nonsense and unintentionally legitimize at least part of the complaints. Ye gods I'm tired of both sides of this dreck. I dispute that there was a lot of fan criticism. I saw a lot here, and some on MTG Salvation, but what I saw on Twitter and Tumblr was positive and a lot of what I saw got very invested in the Chissa ship. I also happen to think that this was a very logical place for her character to go, regardless of whatever real-world stuff is or is not have been going on around that. I know there was some love on Tumblr. I also know there was a lot of pushback there too. I can't really speak to what proportions that might constitute largely because Twitter and Tumblr is content you can curate. It's one of the reasons it's such a bad echo chamber. I do know Youtube didn't care for her, and anecdotal real life data (which is statistically sketchy) says people didn't take to her new character either. Most of the criticism I remember was in Origins/BFZ and the "Chissa ship" only started getting popular in Kaladesh right? There could be 15 months worth of narrative decisions made while here popularity was low. I could buy that she was not as popular as other members of the team, and some minor narrative decisions were made based on, but "well, the Internet hates her, so we'll make sure to boot her from the team in 2.5 years" is vastly too simplistic. Its likely she'll return for the moment they'll kill Bolas.